Acts 17:6,8 mention the “rulers of the city” of Thessalonica, who beat and imprisoned Paul and Silas. Luke, the inspired writer of Acts, is a most careful historian. Different cities/districts used specific words to designate their rulers. Here Luke uses the word “politarch” (πολιτάρχης) which was a “very rare title for magistrates” (see Schaff below). Was Luke correct or was he mistaken? Last month in London I was able to photograph a very important inscription, the Politarch Inscription of Thessalonica, removed from a Roman gateway of the city. 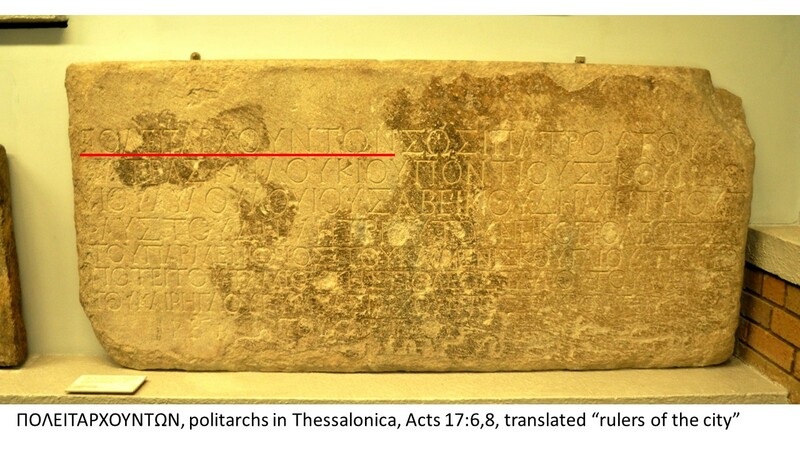 Inscription from Thessalonica using the word “politarchs” to designate rulers, as found in Acts 17:6,8. Photo ©Leon Mauldin. British Museum. 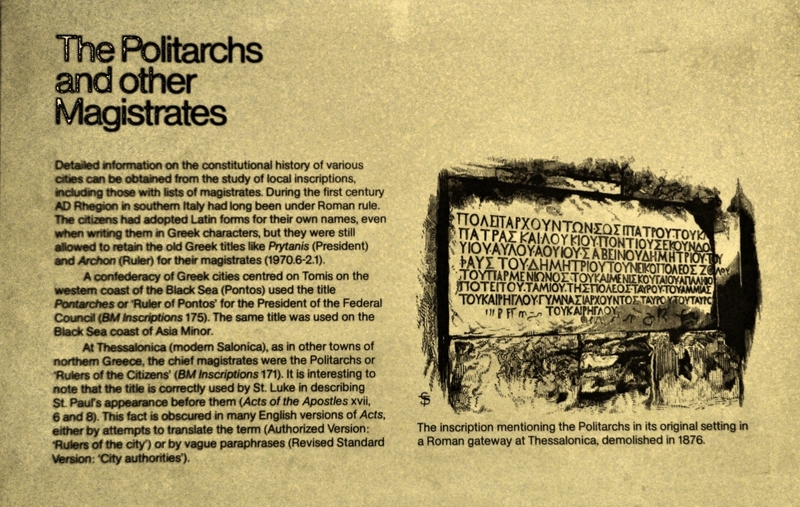 The “politarchs” of Thessalonica, 17:6, 8 (Greek text: τοὺς πολιτάρχας, i.e., τοὺς ἄρχοντας τῶν πολιτῶν, praefectos civitatis, the rulers of the city). This was a very rare title for magistrates, and might easily be confounded with the more usual designation “poliarchs.” But Luke’s accuracy has been confirmed by an inscription still legible on an archway in Thessalonica, giving the names of seven “politarchs” who governed before the visit of Paul. ΠΟΛΕΙΤΑΡΧΟΥΝΤΩΝ ΣΩΣΙΠΑΤΡΟΥ ΤΟΥ ΚΛΕΟ. (Schaff, P., & Schaff, D. S. (1910). History of the Christian church (Vol. 1, p. 735). New York: Charles Scribner’s Sons. Inscription in its original setting in Thessalonica. Photo ©Leon Mauldin. British Museum. In other words, time and time again, Luke has been proven to be right! You can trust the Bible! I should mention that this inscription is not regularly on display. It took three days to get an appointment to go into the room where is it housed, but it was worth it! You are currently browsing the Leon's Message Board blog archives for the day Wednesday, February 21st, 2018.